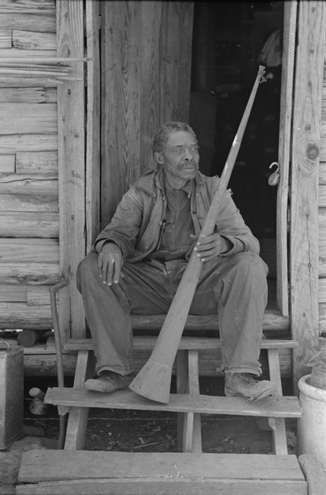 Source: Library of Congress; Reproduction Number: LC-USF33-012186-M2 and LC-USF33-012186-M1; see more information about the photos here. The above pictures were taken during the Great Depression, as part of the US government’s Farm Services Administration photography project of 1935–44. The project produced hundreds of pictures that depicted the lives, and struggles, of rural Americans. The pictures, taken by Russell Lee in 1939, feature an unnamed black man who was reportedly born into slavery. (The Civil War began in 1861 and ended in 1865. Assuming the person in the pictures was born in 1865, he would have been 74 years old. My own observation is that he looks good for his age.) 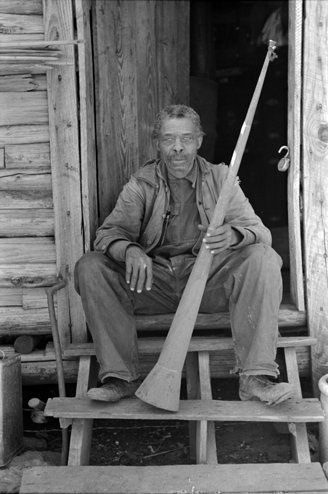 He is holding a horn that, according to the photo caption, was used to call slaves to work… a grim reminder of what many Southern whites would recall as the good-old days. The picture was taken in Marshall, Texas, which is in northeast border of the state, and between Tyler, Texas and Shreveport, Louisiana. I wonder why the man in the photo chose to keep this artifact? What memories did it stir in him? And what feelings does it stir in us today, if any?